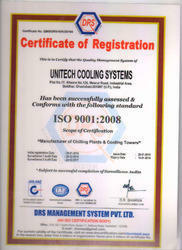 We, Unitech Cooling Systems, started in the year 2012, are one of the foremost manufacturers and wholesalers an extensive array of Adsorption Type Dryers & Air Cooled Screw Chiller. Our offered range consists of best grade Adsorption Type Dryers, Air Cooled Screw Chiller and Air-Cooled Scroll Chillers. To manufacturing these offered products in compliance with the set industry standards, our experienced professionals use the modern machines and tools. Our products are appreciated for their features like easy usability, high quality, simple installation and longer service life. Apart from this, these offered ranges are used in various industries. Our company has established a well-equipped infrastructural unit, where all facilities related to our business domain have been installed. It has various departments like production, quality control, and others, which helps us in performing our business process in the best possible way. We have a team of dedicated professionals who have excellent knowledge and expertise in manufacturing these types of products. They monitor all the steps of production to make sure that all the chances of defects and malfunctioning are eliminated. Apart from this, our ethical business practices, customization facility, and timely delivery have made us popular with the clients. Under the direction of our mentor, Mr. Ravinder Tyagi, we have been able to create a huge patron. With the help of his sharp business approach and skills, we have gained a top position in the market. Our organization is known to be one of the trustworthy manufacturers and wholesalers of the adsorption type dryers & air cooled screw chiller. For the aim of maintaining industry norms, we made these products through a series of predefined quality checks. Apart from this, our company takes pride in providing products of superior quality at very affordable rates. Quality is our main forte and we lay strong emphasis on the quality standards of our adsorption type dryers & air cooled screw chiller that enables us to deliver total satisfaction to the customers. Owing to our high-quality products, we have gained a top position in this domain. We are also customizing this range of product as per the specifications detailed by the clients. Apart from this, we try to satisfy our clients by offering them best quality product array. We have constructed a sound infrastructure facility. The unit is segmented into various parts in order to run all the business activities in a hassle-free manner. These sections are equipped with the latest technology machines. Our infrastructure unit enables us to meet the qualitative and quantitative requirements of our clients..